Salar de Uyuni – the Bolivian salt flats – are touted as an absolute must-see in South America. Many people I have spoken to who have visited this remote, wide expanse of salt describe it as the highlight of their South America trip. For some, it is the most mind-blowing place they have ever visited. 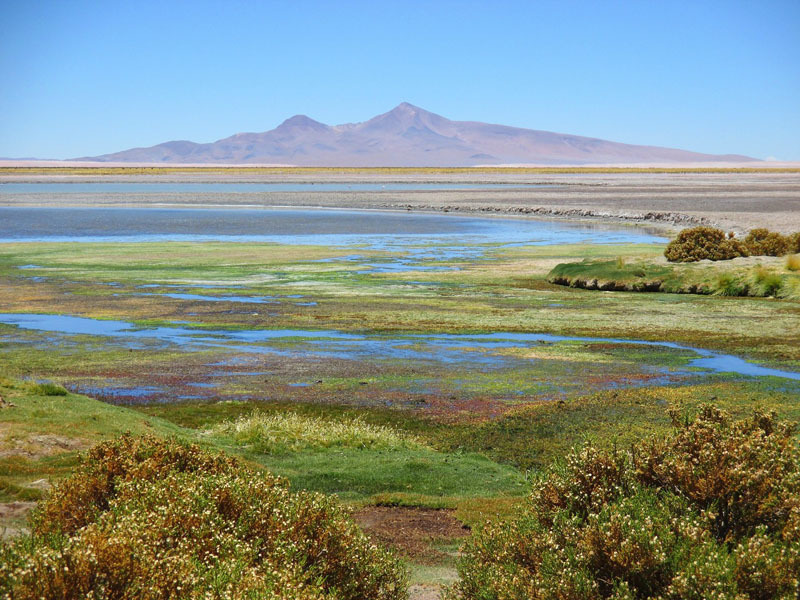 But there is another spot that rivals its beauty – Salar de Tara. It may seem strange then that during my trip to South America, I didn’t leave myself enough time to visit Salar de Uyuni. However, it was the rainy season, and having read about some sections of the tour being closed off during this time, I thought best to save it (and Bolivia) for another time. I was later told by someone I met in Chile that the rains didn’t cause any issues during his visit. And I could have seen the famous ‘mirror effect’ which is created by a thin layer of water covering the salt flat. But that’s the nature of travel regret I suppose! You will always wish you did things differently. Anyway, without feeling too much regret about skipping it, I decided to spend a week exploring the Atacama Desert, to get my fix for otherworldly scenery. The definite highlight of this week was joining a tour to Salar de Tara, with Cosmo Andino. This agency is well-established and highly reputable, but with a service as good as theirs, it comes with a higher price tag than other agencies. But I would say it’s worth it. The guides are enthusiastic, friendly and knowledgeable; the groups are small, the food is excellent (dietary requests can also be accommodated), and there is ample time for photo ops. Where is Salar de Tara? 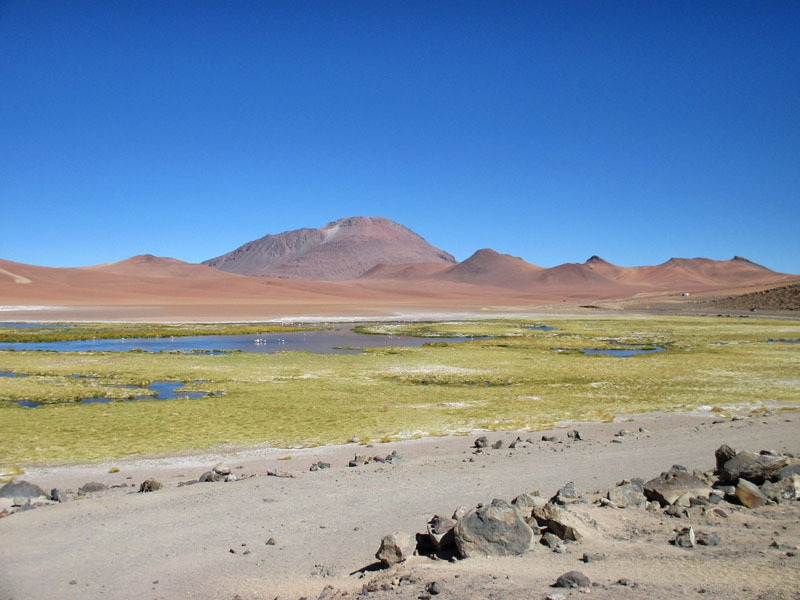 Salar de Tara is located within the Los Flamencos National Reserve, and borders with both Bolivia and Argentina. 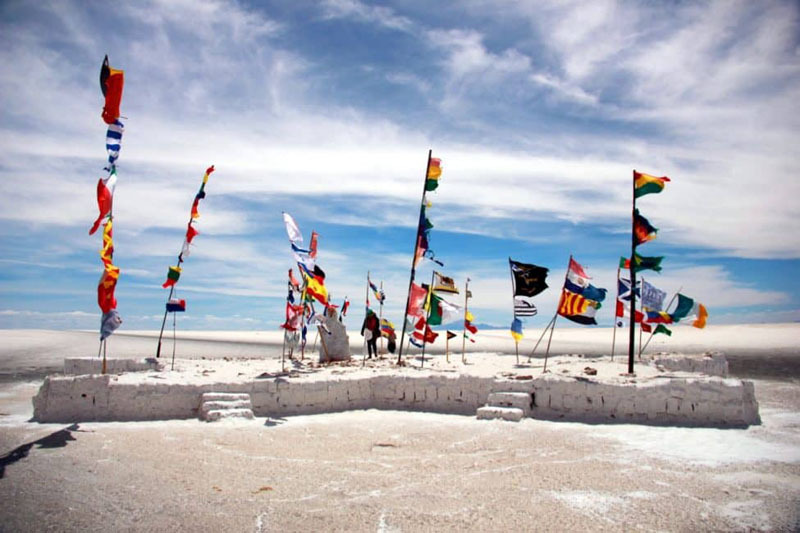 During the ride to these salt flats you make various stops along the way; first to appreciate the curious geological formations and diverse landscapes, but also to acclimatise (altitudes in the region reach up to 4,860m). The first stop was a small salt flat, featuring smooth desert textures, and orange, pink, blue and yellow hues that combine to create an extraterrestrial scene. 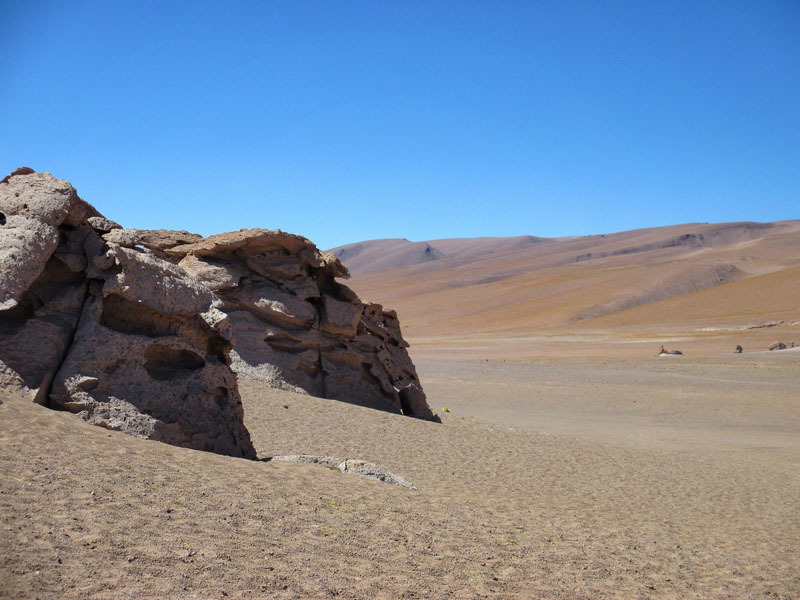 It is a perfect example of the uniqueness of the Atacama desert, where different – seemingly distinct – natural features combine in a captivating, almost science fiction manner. We get back in the minivan and drive onwards. The next stop was a lake of deep blue and subtle green, with purple mountains and volcanoes in the background. I was mesmerised by the scene, as it was just so bizarre and alien. But really, each stop was a teaser for the next; and now we were going off-road, into a wide expanse of desert. 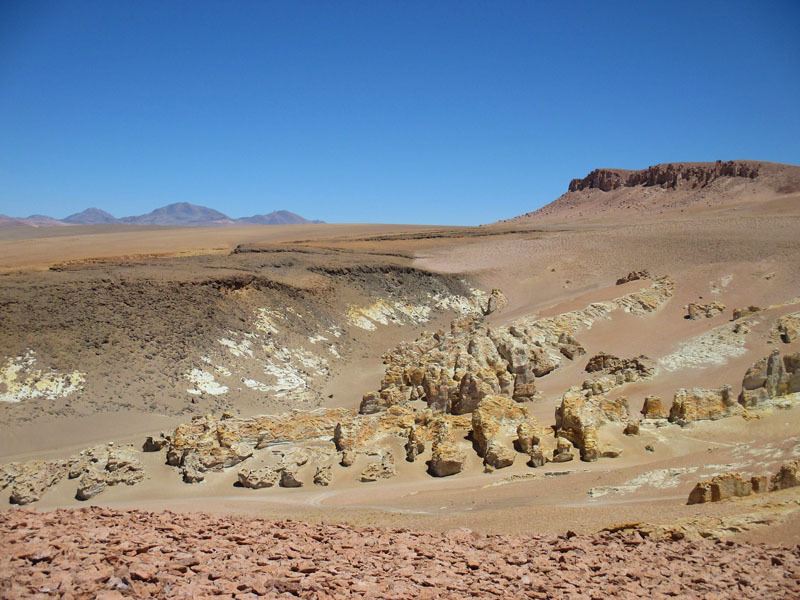 After a bit of a bumpy ride, we stop and have some time to appreciate the strangeness of the Atacama desert. The first sight was a giant rock spire jutting out of the bare ground. And I mean it was a giant. Although I’m not standing next to this rock for scale, I would be miniscule next to it. There were many surreal, rock formations randomly scattered throughout this barren, desert terrain. We get back in the minivan and carry on uphill towards a vantage point. But then we get stuck! Well it’s off-road after all – this kind of thing happens. We all get out, collectively push the minivan and successfully get it unstuck. And so the journey continues. As we approach the vantage point I get my first glimpse of Salar de Tara itself, and the sight was literally breathtaking. Unbelievable! How can this kind of landscape exist here, on planet Earth? Now this felt really remote, truly far away from the world and anything familiar. As far as the eye could see, I was presented with stunning scenery. I could see a seemingly never-ending expanse of desert, the multi-coloured lake of the salt flat, and the ‘rock cathedrals’. My jaw dropped in awe in every direction I looked. After, we drove down towards the lake, where we would have lunch. Along the path down to the lake you walk besides spiky, bright green plants and aquatic-looking vegetation. It’s incredible that they that are able to grow in these arid conditions – in the driest non-polar desert on the planet. Down by the shores of the lake, flamingos gather to drink (or eat, I’m not sure). The only sounds are our hushed conversations, flamingos squawking and splashing, and the peaceful trickling of water. Flamingos definitely added a dream-like quality to the experience. But the highlight of the trip was walking along the lake, and admiring the contrast of vegetation, purple mountains, a perfect blue backdrop of sky, and a mystic lake shimmering with colours. Where did all of these colours come from? I imagined a clumsy artist spilling all of his paints into lake, creating a work of art by complete accident. I had the feeling of being drugged and transported to an alien paradise, serene and unreal. It was like a psychedelic experience in many ways. I was in a trance, filled with wonder at this sparkling, crystalline lake. The strange vegetation and creatively carved mountains in the background gave a distinct, hallucinatory atmosphere to the place. We have lunch, and we start talking about how beautiful this place is. For many travellers in San Pedro de Atacama (the busy tourist town located in the Atacama desert), this is their favourite tour. A family in the group was joining the tour for a second time, as they said the photo ops were endless. After lunch, we make our way back, stopping at some more fascinating rock formations. 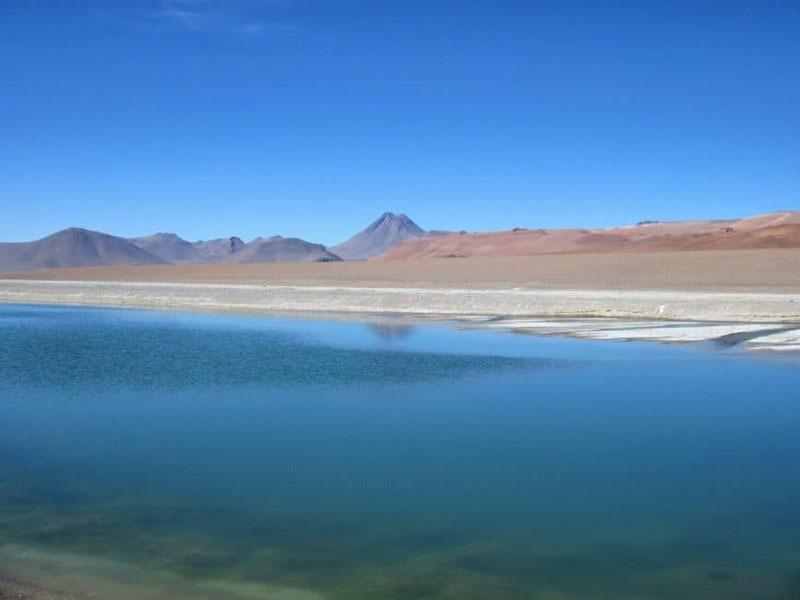 There is one final stop before returning to San Pedro de Atacama, and it is another colourful lake! I think this clumsy artist had visited this one as well, spilling all of his white paint into the water. Puffy white clouds drifted like watchful satellites over the lake and desert. It’s safe to say that this tour completely blew all the other ones out of the water (including Valle de la Luna, Piedras Rojas and Lagunas Altiplanicas). I would have to recommend this tour above all others, if your time is limited in this wonderful region of Chile. I think this kind of otherworldly scenery is the most fun to visit, and I will have to see the Bolivian salt flats for myself; sometime soon I hope. 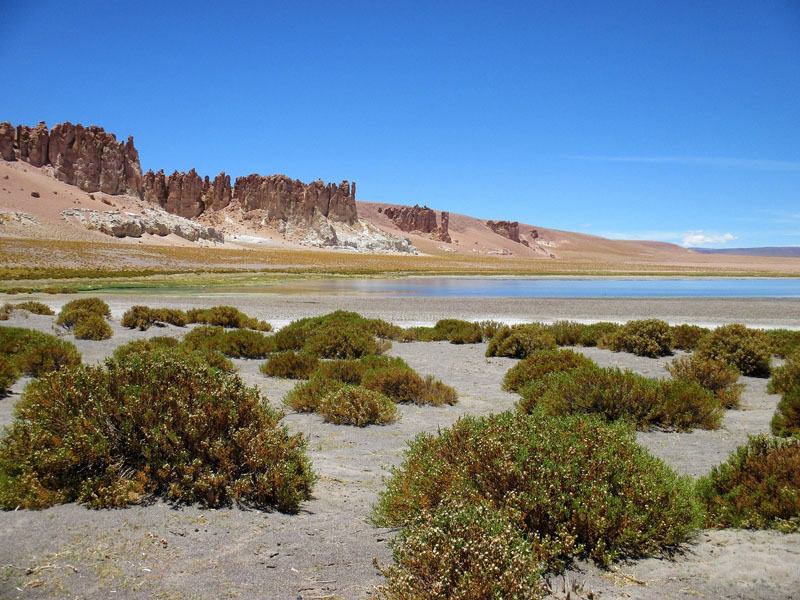 But if you’re looking for a less well-known and easier to visit alternative to Salar de Uyuni, Salar de Tara is definitely worth considering. Sam Woolfe is a Writer at The Canary. 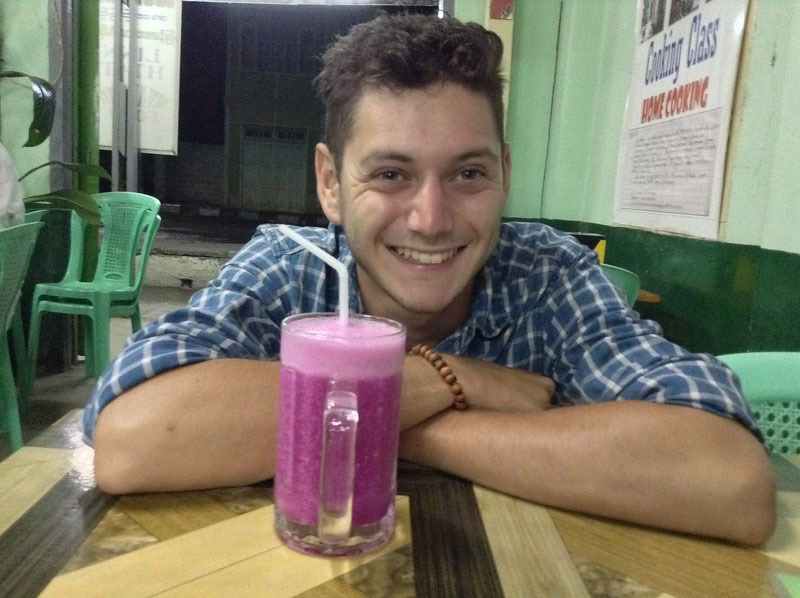 When he’s not covering global or environmental issues, he reflects on travel on his blog, and writes about whatever else interests him on his website. Follow him on Twitter. 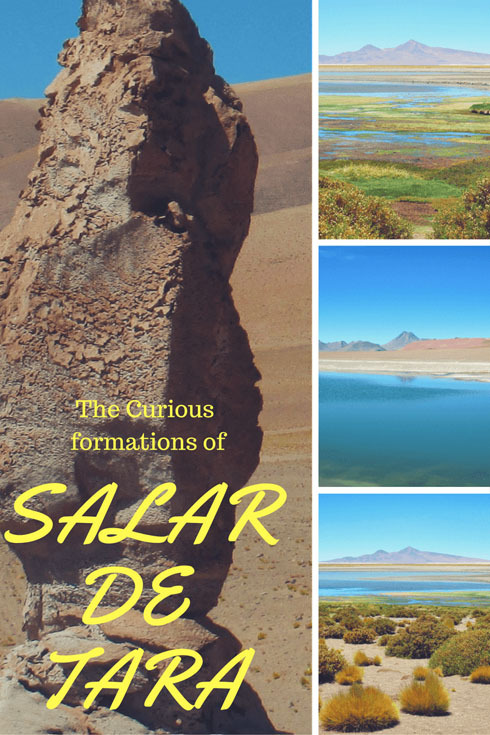 9 Responses to "Salar de Tara – An Awesome Alternative to the Bolivian Salt Flats"
Thanks for the pictures! We started a self-drive to Salar de Tara but decided to go back after almost getting stuck in the soft earth and not being confident of DIY in such a remote area. I have to say though that the Salar de Tara and Salar de Uyuni are 100% totally different, it’s like comparing seeing Niagara Falls to seeing Lake Victoria. Unfortunately it’s not really a replacement for the other, so I guess you’ll have to go back to Bolivia ;). Firstly – great fantastic pics! 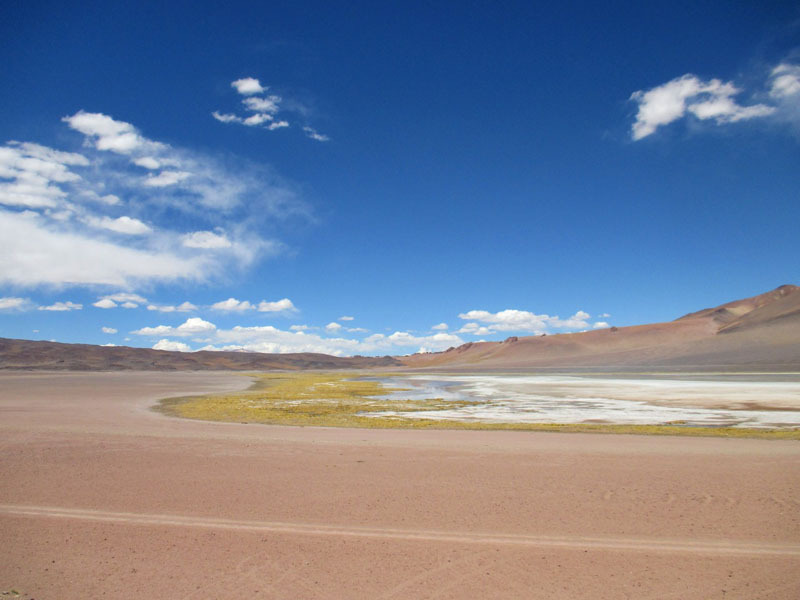 Secondly – it is very hard to compare Salar de Uyuni with Salar de Tara; both are fantastic places but so different; we visited both locations in 2016 and I could not say which is my favorite. Sometimes I think it is Uyuni next time I’m sure it is Tara. really awesome to read your article, but am also i did not heard salar de tara place…anyway your blog is superb and pictures are amazing…..
Well honestly i’ve never been to desert before. But by looking at your shot, i never thought a dessert could be amazing like that Definitely Salar De Vara will be in my travel list! 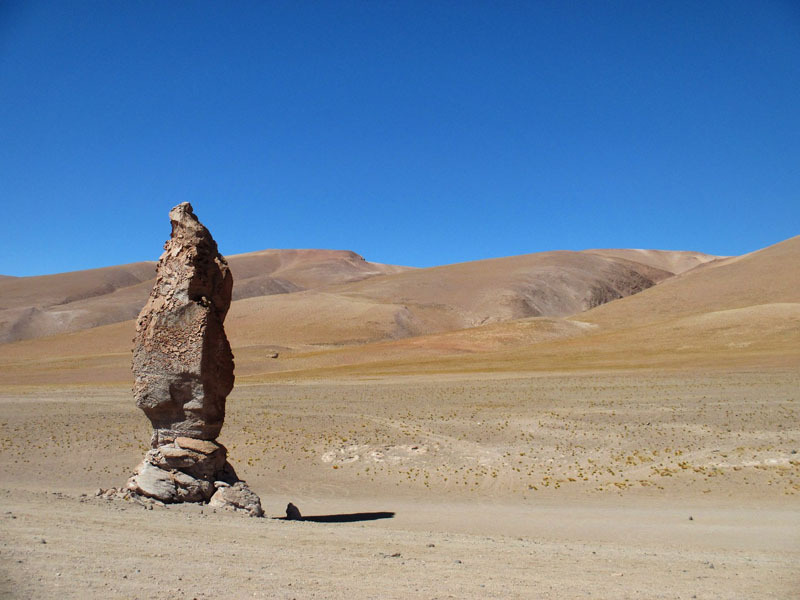 I enjoy otherworldly landscapes but I had never heard of Salar de Tara before this post. Looks really cool! It remind me a little bit of Cappdocia. So many awesome places to visit in the world. Hey! Glad you like the shots 🙂 Yes, the feeling of being on another planet is unforgettable. Driving was fine up until the more desert region with the weird rock formations. Then it’s pretty bumpy. But otherwise, there’s well kept roads, so no problems there. Brilliant shots! The other worldly, Mars-like nature of the place strikes me the most. I also think: what’s it like driving to such a place? The roads? The views? Breaking down LOL?! Amazing region in an amazing country. For all the deserved talk about Africa and the South Pacific, Chile is one of the last wild, pristine places on earth. Thanks for sharing!